Boone County Nebraska Genealogy is part of the Nebraska History and Genealogy Project. Our names are Judy White and Dennis Partridge and we are the county coordinators. If you have information about this county you would like to place online, then please contact us using the contact form on this website. The American History & Genealogy Project (AHGP) is a group of like-minded individuals committed to providing free access to American genealogical and historical information online. Organized by locations, volunteers host states, counties, and sometimes town or city websites specializing in their areas of interest. Come join us today! 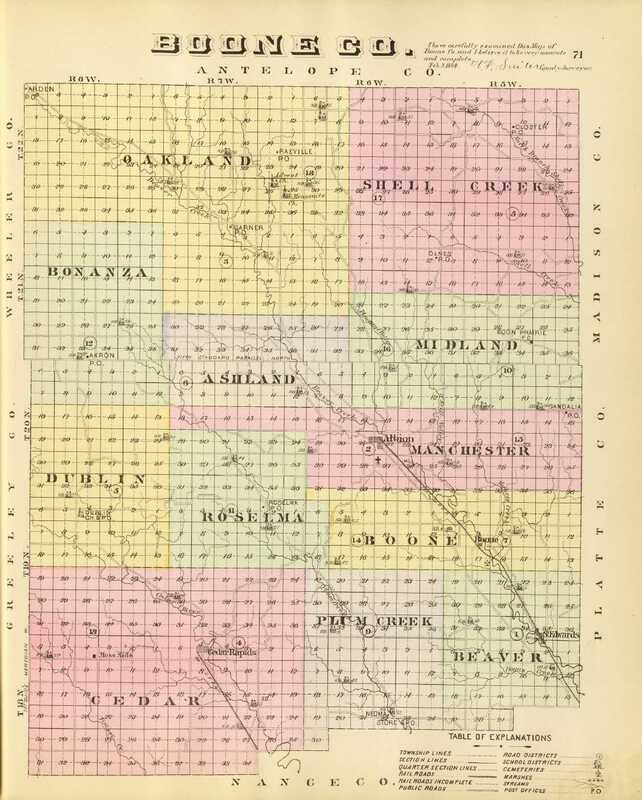 The population, which the census of 1880 gave at 4,595, and which is now probably 5,400, is composed largely of settlers who have come from Illinois, Wisconsin, Minnesota, and the Northern States further east. Only a small per cent is foreign. Thrift, sobriety and intelligence are characteristics of the people, and schools, churches and the other attendants of civilization have followed rapidly in the wake of business prosperity. Cheap lands, good neighbors and quick returns are the advantages which Boone County offers to those seeking homes.